Nordsternpark, which evolved from the Federal Garden Show in Gelsenkirchen in 1997, presents post-industrial garden design in the spirit of the International Architecture Exhibition Emscher Park (IBA) in a landscape park on the disused terrain of a former colliery and on old industrial land. The history of the area – the history of Nordstern colliery – and the widespread excessive shaping of the industrial landscape remain present as no attempt is made to create aesthetic harmony or a smooth transition where the legacy of the past meets new elements. Former winding towers and colliery buildings are important landmarks which form identification points in the landscape. A “slag-heap passage” and a “slag-heap pyramid” create new views and provide focuses. New impressive bridges form outstanding elements of the new infrastructure and connect the town districts across the canal and the Emscher river. The landscape park uses oppositeness to highlight elements. Barriers are broken in order to create links. The park structures satisfy due to their formal transparency and simplicity. The new “earth architecture” is technological. It is a sign of what has been “artificially created”. The reclaimed land is an important area for local recreation for the adjoining town districts. Visitors come from throughout the region to experience attractions such as “Kinderland” and the “Amphitheater”. Due consideration is given to the urgent need for ecological renewal through the development of a sufficient number of areas where flora and fauna can regenerate. Landscape architects Prof. Pridik + Freese (Marl /Berlin) collaborated with architects PASD Feldmeier + Wrede (Hagen) to design the terrain as a post-industrial landscape park in the spirit of the IBA Emscherpark. In 1992, PASD Feldmeier + Wrede were winners of first prize at a nationwide competition for ideas and their realisation. Planning and realisation of Nordsternpark was commissioned by theBundesgartenschau Gelsenkirchen GmbH and took place in 1997. 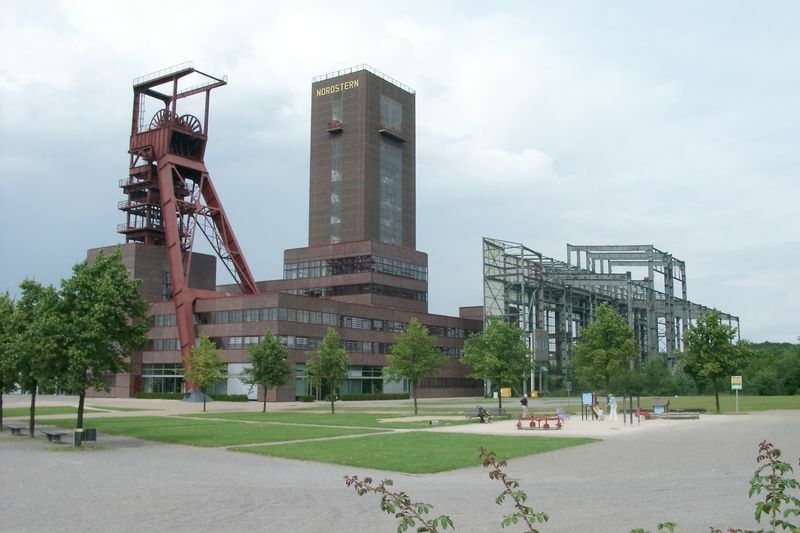 Visitors to the approximately 100-hectare “country” between the two town districts are presented with a panorama of the Ruhr area: slag heaps, steel towers and structures, lines of cables bundled together, sections of railway track and waterways as well as green islands in the midst of a ubiquitous landscape of roofs. The harmony of past and present “activates” visitors to listen to the area’s history – the history of Nordstern colliery, a cubistic composition of brick walls and steel with pit frames, bridges, walkways and pipelines which weigh down on the terrain, run up to buildings or suddenly disappear into the earth. It is still possible to see the widespread excessive impact made on the landscape by industry as no attempt is made to create aesthetic harmony or to smoothen over the places where the legacy of the past meets new elements. Differences are not blurred. The cultural language of the industrial landscape is used to adopt and symbolically highlight linear axes, the sharp edges of embankments and lines formed by waterways. Winding towers and colliery buildings are important landmarks which form points of identification in the landscape. “Bridging components” form outstanding elements of the new infrastructure and connect the two town districts with a suitable vocabulary of design. Urban expansion is used as a means of developing the former colliery ensemble in connection with existing residential areas. The landscape park uses oppositeness to highlight elements. Barriers are broken in order to create links. The park structures satisfy due to their formal transparency. Like the industrial supply network, they are linear, constructive, self-evident and defy the random nature of the man-made topography. Paths dig their way straight into heaps of earth or run on high over hollows along steel bridges and walkways. The new “earth architecture” is technological, the sharp regularity of embankments signalling that it is “artificially created”. In 1997, the landscape park and Federal Garden Show were the setting for a summer-long opening festival. The “driving forces” of the Federal Garden Show and the IBA have resulted in a disused area being transformed into a flowering landscape within just a few years. This is a landscape park which provides space for relaxation, leisure, work and living as well as natural areas full of suspense and surprises. 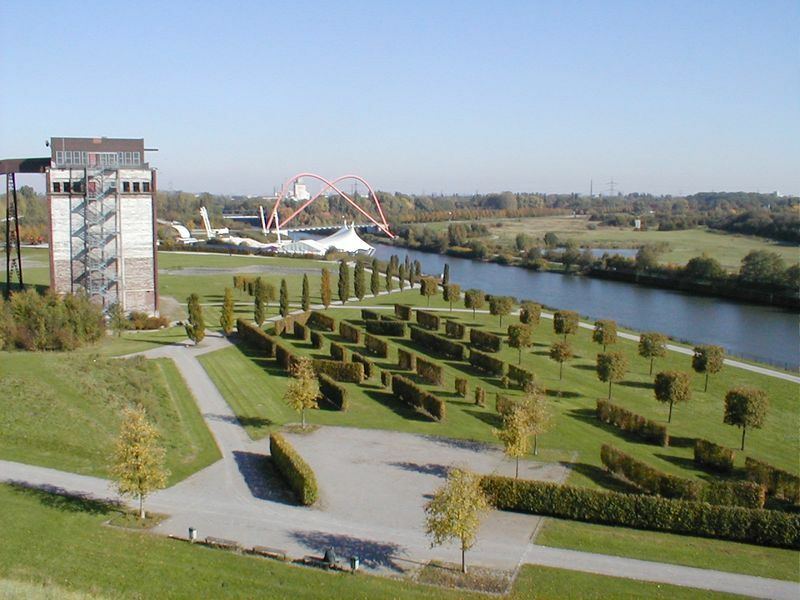 Today the landscape park is a firm component of local recreation in the Horst and Hessler districts of Gelsenkirchen and is a destination for visitors from throughout the region. In summer, “Kinderland” with its water cascades for children is just as much of an attraction as the “Amphitheater” for open air events. Visitors will find extensive stretches of grass and shady woods, water in all its forms – as a natural pond or a harbour for games, as a canal or, in the future, as the Emscher river, landscape and town gardens, a slag heap park with an Alpine climbing area as well as impressive “earth architecture” with a slag heap passage and a slag heap pyramid. The business park in the ensemble of the former colliery buildings provides an urban focus. These buildings are linked into the adjoining neighbourhood by an open space for festivals and a generous flight of steps. New housing at Nordsternpark adds to the character of this area of town. 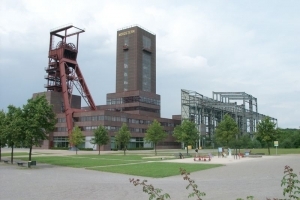 Both visible symbols of the Nordsternpark – the winding tower of the former Nordstern colliery with its surrounding wall and the impressive double-arched bridge across the Rhine-Herne canal – span the distance between the past and the present and thus point the way to the landscape park’s future.